Context: While reading this we got two male kittens which will be neutered today… much to the author’s approval I’m sure! This is a tricky book to read and understand. 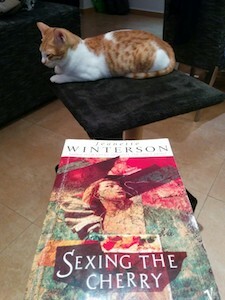 Obviously, Winterson is a leading apologist not only for feminism but also lesbianism so you can expect that to feature to a certain extent, particularly if you come to this from Oranges are the Only Fruit and The Passion. What sets Sexing apart is its style and setting which, with large amounts of 17th century magic realism, is a complete departure from anything she had previously written. The novel is complex playing as it does with time, theme, character and plot to produce a continually shifting narrative where you really don’t know where you stand or who stands with you. This has to be entirely intentional bearing in mind Winterson’s beliefs that truth is entirely relative and that there are no fixed realities in life. Pretty much anyone who reads this will find it to some extent disjointed and confusing and therefore uncomfortable. I’m sure she would rather agree that this is because we have bought the lie of our fixed reality rather than concede that the truth actually does exist and we work better when we know it. The title comes from the grafting process whereby two female cherry trees, grafted together, will themselves produce a female which is hardier than the two parents and which, vitally (if that’s the right word) for Winterson’s mandate, does not require a seed to come into being. Thus, as with Oranges, the message that men are less than equal cohabitants of this planet comes across not only in metaphorical terms but also in their relegation to oppressive or minor roles. Thus, the book, for me continues where Oranges left off with assumptive thinly veiled bigotry aimed at defeating preconceptions and prejudice. It thus fails to actually engage me in the issues that Winterson is undoubtedly hoping I will consider which, for someone so obviously talented a writer is a shame. Perhaps her later novel, Written on the Body, which I’ve yet to read, will finally get through this thick, male, heterosexual, conservative skull of mine! Empty space and points of light.